In an age dominated by directors, very few screenwriters get singled out for consistently original work, and fewer still as frequently as Charlie Kaufman. Through his densely constructed, puzzlebox scripts, Kaufman expresses fundamental human longings through bold surrealism and dark, self-deprecating wit. After a long stretch writing for television shows, including Get A Life, Ned And Stacey, and the short-lived The Dana Carvey Show, Kaufman broke through with 1999's Being John Malkovich, a comedy about the discovery of a portal into the titular actor's head. He re-teamed with Malkovich director Spike Jonze on 2002's Adaptation, which converted his real-life frustrations in adapting Susan Orlean's The Orchid Thief into a movie about those frustrations (and, miraculously, about the book, too). 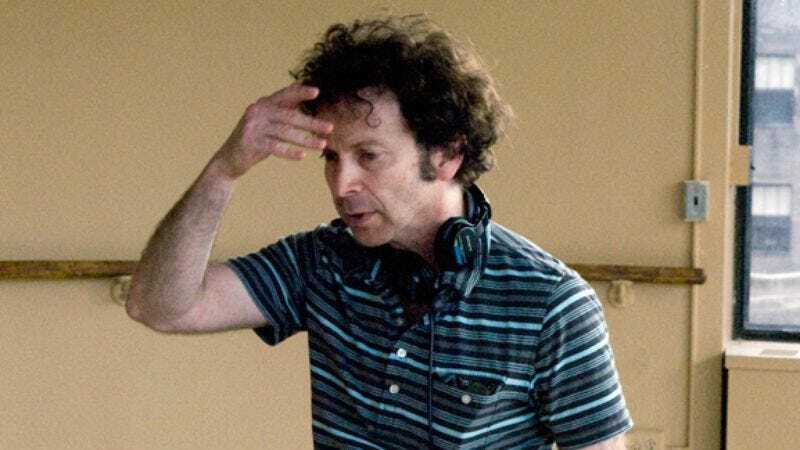 Kaufman has also worked twice with director Michel Gondry, on the ill-fated 2001 comedy Human Nature and 2004's masterful love story Eternal Sunshine Of The Spotless Mind, which won him an Oscar for Best Original Screenplay. He also adapted Chuck Barris' autobiography Confessions Of A Dangerous Mind, which George Clooney turned into his directorial debut. Stepping behind the camera for the first time, Kaufman squeezes many of his favorite themes into his crazily ambitious new film Synecdoche, New York: love, death, anxiety, and the life of the creative mind. Philip Seymour Hoffman stars as his alter ego Caden, a regional theater director who receives a MacArthur genius grant and decides to stage the play of a lifetime. Literally. It's the ultimate personal project: An opus that incorporates every moment of his waking life and keeps building on itself, ad infinitum. Kaufman recently spoke to The A.V. Club about his lack of style or influences, his thoughts on eternal creation, and why film critics hurt his feelings, even though they're human too. The A.V. Club: What was the genesis of this idea, and how did the screenplay develop? Charlie Kaufman: Spike Jonze and I were originally going to do it together, and we were approached by Sony to do a horror movie. We talked about doing something that was scary in the real world, and what would that be. We talked about things that scared us, and we went in and proposed it, and they sent me off to write it. It was never going to be a genre horror movie, I don't think. Then it just got pegged as a horror movie because in Variety the next day, it said, "Jonze-Kaufman Sell Horror Movie." So people have been waiting for five years to see that horror movie, and I don't think it's a horror movie. I guess it is in certain ways, just not if you're expecting that sort of thrills-and-chills horror movie. We asked ourselves, "What's scary?" Scary is time passing and sickness and dying and regret and isolation and loneliness and relationship problems—as opposed to a guy in a hockey mask, which didn't seem that scary. AVC: Did the studio get what they expected? CK: They knew, pretty much. When we proposed it, we were pretty vague, but they knew some of the details. At the time when we proposed it, [Sony president] Amy Pascal said, "Well, just do whatever you want. It doesn't matter what you pitched. I was just going to hire you anyway." She wanted to work with us. We did Adaptation with her, so we had a good relationship with her. When it came in, I think she liked the script, but it was kind of like, "Who is this for? ", which I guess is a concern for studios. And then when it turned out that Spike was not going to direct it, and I was going to direct it, it became clear that this was too risky for them. I think it gave them some security that Spike was going to do it, but without him, they put it in turnaround and it was picked up by a company that financed it, Sidney Kimmel Entertainment. Then after we finished it, we tried to find a distributor and we found Sony Classics, which is a completely separated arm of Sony, independent. AVC: You've been closely involved in the filming of most of your screenplays, but have said in the past that you weren't often on set. Was there a steep learning curve in directing your own feature? AVC: Were you comfortable working with actors? Were there aspects of production that were foreign to you? CK: I had gone to film school, and I'd made movies, and I've been making little movies. As a kid, I had a background in theater. I did a couple plays the year before we shot this, with professional actors. It turned out to be a good experience directing actors, and that made me more confident about that aspect of it. Probably if I were to separate out different parts of the movie, the cinematography and that sort of stuff is… I'm not a particularly technical person, and I was concerned about that to a certain extent, but not overly. I had a very good group of people around me, who I felt were not only going to be helpful, but weren't going to be intimidating, or mocking. [Laughs.] So the crew was really nice and respectful. I think that most people were there because they wanted to work on this project. It wasn't the kind of thing you hear about with first-time directors being openly dismissed by the people they work with. Before the first day, I was concerned that I wouldn't know when to say "action." I knew that it would just be a first-day thing, but the first shot of the first day… I was a little anxious about that. [Laughs.] Was I going to say it at the wrong time? Because you've got to say it after all this other stuff happens. I mean, it's ridiculous and meaningless, but I worried it would set the tone for the production if I didn't know when to do that. AVC: When you're deeply embedded in writing, directing, and editing, does it become hard to step back and get perspective on whether the movie is working? CK: It's a problem and it's not a problem. I think it's always a problem on every movie I've worked on—and I've been involved in all of them in post-production and editing—to have the same perspective as an audience member who hasn't seen the movie. Which is why you have screenings. It's the only reason we've ever done it, and it's one thing that we've taken from working with Spike and Michel. It's like, "We want [the audience] to understand this, but they don't." Sometimes you don't care, or you don't want them to. But this is important to us—sometimes when [viewers] have questions, we ask ourselves, "How do we clarify that kind of thing?" You can never have the same perspective, except maybe a few years later when you catch it on TV and see it in a different way. I don't think it's possible, otherwise, for anybody. But I also think perspective is overrated and not what I'm going for. When I'm writing, I'm trying to immerse myself in the chaos of an emotional experience, rather than separate myself from it and look back at it from a distance with clarity and tell it as a story. Because that's how life is lived, you know? Life is not lived 10 years ahead of itself—there's a lie to that. The conventional wisdom is—people say this all the time—you should only write something when you're far enough away from it that you can have a perspective. But that's not true. That's a story that you're telling. The truth of it is here, right now. It's the only truth that we ever know. And I'm interested in that truth and the confusion being part of the experience and sorting it your way through and figuring it out. So if my movies don't have perspective and they're created in that "now," then I'm kind of okay with that. It's desirable. AVC: When you say a screening, are you talking about for the public, or for people whose opinions you trust? CK: On this movie, we quickly decided we weren't going to have any of those public screenings. But we had many friends-and-family screenings, trying each time to invite people who hadn't seen it before, or didn't know anything about the script. People whose opinions you trust, but also people you can trust not to start disseminating stuff online, which is a big issue these days. It's difficult when you're working on something, to have it out there churning with its own life. AVC: That's happened to you before. CK: It always happens. And it always happens when you have public screenings. You can't avoid it. So if you're inviting people you know or who are friends-of-friends who you can trust… For this movie, I think we were pretty fortunate not to have things like that start happening until we were okay with it. AVC: This film is about a guy who never quite wrangles the enormity of what he's creating. Is that part of your experience, as well? CK: Well, it is—in the sense that it parallels the writing process that I strive for, which is that you're trying to be honest about something, and as you write something over two years, more and more ideas and information and thoughts come into your head. And if the process is open to including those—which mine is, which is what I'm going for—in theory, that work can only be finished when you die. That's really the only ending. It is like a constantly evolving world, but that's the truth of your life. Every day of your life, you have information that enters your head, and that information informs your understanding of things, or shifts it, or changes it, or deepens it, or confuses you. Every day, every moment of every day—it's like this thing that happens. You're having this conversation with me now, and after this, you will have had this conversation with me. And that'll be part of your brain, and vice versa. There seems to be a profound truth there, to me, to explore how we are in the world as people. And I'm interested in it, so I try to be honest in my presentation of it, which is that there are no grand conclusions. And there aren't, really. I think things, and then I don't think them anymore, and then I think them again. That's sort of the way life works for me. AVC: Is there something appealing for you in the notion of embarking on a lifelong, unending project, as Caden does in the movie? Is there a part of you that would like to just create, and not have to put a work out into the world? CK: Yes and no. I like putting things out into the world. And though I do think [eternal creation] is fascinating as a theoretical idea, I personally get tired of things. I want to start thinking about something else—and I got paid, and I have to turn in something. Those kinds of issues are real. I want to make it into a movie at some point. I like that ending to it. That's exciting and fun for me. I like people to see it. It's hard sometimes for people to see it when they react in certain ways. But I like it. There's a nice thing about putting something there and letting it just be. AVC: Is it easy for you to make peace with how people see your work? CK: Sometimes and sometimes not. I guess I'm not just one thing. I don't like when people are mean and my feelings get hurt. I don't like when critics review from up on high, which I think mostly they do. They present themselves as an objective authority. I really like when critics reveal their subjectivity and their humanity. I prefer it when people say nice things, but if they say not-nice things or things that are critical, I'm open to it and I accept it. I mean, I have to live with it. But I do think there's a dishonesty in not acknowledging that you're a person with an opinion. I think it's almost like a power grab. AVC: Isn't there some tacit understanding that that's the case? CK: No, not by me. I read stuff and they say it in no uncertain terms, whereas sometimes you'll read things like, "this is how it affected me." And I really like those things. Obviously, when people are affected in deep ways by something I've done, it's moving to me. But I often think there's an ego-driven confrontational quality to a lot of these things. I don't know if their egos depend on it, if their jobs depend on it, but they're making pronouncements. You know what's interesting to me? I do this a lot now. I've done these interviews and interviews with people reviewing the movie and interviews with people who end up writing profiles of me, and almost never does anyone include who they are in the interviews, which is a shame, because they're people, too. They're people with quirks, nervousness, and confusion when they talk to me, which is very human. I very much attempt to include that in my work, because I think that's the honest thing to do. AVC: Wouldn't readers consider that to be indulgent, though? In a profile or a review of something you did, why would they talk about themselves instead? CK: No, what's indulgent about it is that they present themselves, again, as this sort of objective authority, even by keeping themselves out of the discussion. [Pauses.] I'm hesitating because I'm trying not to talk about specific people who've done this. But I've had experiences recently with people who are just completely befuddled, befuddled people. And I immediately was thinking like, "Oh God, what the hell is this going to be?" And then this sort of magic happens through spending the time trying to make yourself into something else. And they can include themselves in the article, and sometimes they do, but they're always very… I think that might have been my biggest revelation about starting to do press. Journalists are people, and why should I be surprised by that? When I come into this situation with nervous people, sweaty people, people who are playing me, people who aren't present and clearly have an agenda, or people who lie to me and will ingratiate themselves so they can get something and present it completely differently… And they aren't always like that. I've had some really lovely experiences with people, where I felt that the resulting article is really honest, and I appreciate that. So I guess that's what it is for me about reviews. When people say negative things about me—even if it's very much their opinion—I still get hurt by it. AVC: It's a little strange to hear you say that, because you've had a pretty good shake with your work in general. CK: Yeah. There seems to be an intense divide on this movie. I never know. You know, there was a point with Eternal Sunshine where… Okay, I was pretty sure where it's going to be on the [Rotten Tomatoes'] Tomatometer. With this movie, from person to person, I have no idea, and in kind of a nice way. Because sometimes people do write these articles that are so vulnerable to this movie that—I mean, I feel so thrilled to have that sort of interaction with somebody. But then I'll read this really angry review, this really pissed-off stuff. I still get jarred by that. AVC: One problem is that a movie like Synecdoche, New York isn't that easy to process instantly. It doesn't lend itself to instant reaction. CK: Yeah, but that's not a critic's job. This is something that I've said before and I'll say it again: I've spent five years on this. You should spend an hour on it. You know, spend two hours on it. That would be the decent, respectful thing to do, as opposed to writing a snarky five-minute thing that's making fun of me, or saying what other people have said. This is a thoughtful thing. A lot of people put a lot of work into this thing, sincerely. It's not like Garfield, you know what I mean? No one's trying to get rich. People have sincerely put their hearts into this thing. Respect that. Don't like it if you don't like it, but be thoughtful. AVC: On the directorial side, were you looking to other directors past or present as a model of how you wanted the film to look and function? CK: I don't have a style. I wouldn't say I have a style as a writer, either. I know people have said "This is what he does," but when I'm writing, I don't think about that. I don't think about a style. I think about what serves this thing that I'm trying to do. Coming to direct, I wanted the performances to have truthfulness and depth. That was something that was important to me, and that I spent a lot of time on. I wanted it to be shot simply, because a) the story is really complicated and flies off into a surreal thing, and I didn't want to be gilding the lily, and b) I'm new at this and I wanted to make sure I got what I needed, and c) we shot 204 scenes in 45 days, and that's just a pragmatic reality. We had a lot of scenes to do every day, and we had to get the coverage we needed. I would've liked to have been able to fool around and experiment, but it was a meat-and-potatoes kind of thing. [Cinematographer] Fred Elmes and I spent a lot of time talking about this pragmatic problem of shooting exteriors that had to look like interiors. Obviously, we didn't build New York City. We shot exteriors, and in post, we put a roof over it. Those are concerns. And other than that, it was kind of like, just doing it. There are endless things that are decided every day. But I think they were just decisions. I don't think they were in service of creating a style. This is a dreamlike movie. David Lynch is very important to me, and he does dreamlike movies, but my dreams are not like David Lynch's dreams. I have no interest in copying anybody's work. It would never occur to me to want this to look like someone else's thing. People ask me all the time, "What are your influences? Are you trying to do Beckett?" It's like, "No, I'm trying to do me." Whatever that is. I don't know what that is, but that's the basis. I'm trying to be true and I'm trying to be honest. Does it feel like a good idea? If it does, then I do it. The result is the result. AVC: Did you enjoy the experience? CK: Yeah. I enjoyed it, and I didn't enjoy it, and it was really hard and exhausting, but I feel like I liked the idea of having all that stuff to work with. I think that I'd like to do it again, because it was an incredibly big learning experience. Now that I've got the one time doing it, I'll go in and it'll be a different experience. AVC: As much as anything you've written, this film focuses on one man's subjective experience of the world. How does this affect the way you write other characters? CK: I wanted everything to be from Caden's point of view, literally or figuratively. There are no establishing shots, with the one exception being the very end. The film ended up having a very closed, claustrophobic feeling even though there's a very large-scale thing going on. I write the other characters from inside them. I'm trying not to comment on them. And so that's what I did. In Eternal Sunshine, there was more of an attempt to differentiate, because the movie was structured to allow distinctions between Clementine as she might exist in kind of an objective way, and Clementine as she exists in Joel's memories. In this movie, it's completely inside of this person, so the people exist in only this one way. I choose to write characters from the inside because I feel like that's the way I'm gonna get the most honest version of them. AVC: The universe created in this film is massive, but you didn't make it as a studio picture. Did you think it might have been unfilmable, or were you thinking of inventive solutions to these problems while writing? CK: I wasn't, because I wasn't planning on directing it. My relationship with Spike and Michel is that they say, "Don't worry about how we're going do this. Let your imagination go." And they're very resourceful and creative in thinking up solutions. So it wasn't anything I ever thought about. AVC: You've said you want individuals to have their own experience with a film. What did you mean by that, and how is that facilitated in the making? CK: When you have an artistic piece of work, what I like is when there's an opportunity for people to interact with it rather than just be shown. I like projective tests, like the Rorschach or a thematic apperception test, which is another version of a projective test involving an image that's somewhat ambiguous. You'll see a painting of a woman with her head in her hands and a man standing off to the side, and they'll ask "What does it mean?" They're evocative and emotionally rich, but open to interpretation. They allow someone to come in and bring their life into it. And there's a framework here and a story that's universal in the way that it follows a human life to its end, which is something we're all aware we're moving toward. But at the same time, if you leave it open enough and take away the objective of trying to manipulate people toward a certain end, which I don't try to do, you leave it open to the experience of the viewer. I try not to manipulate people or draw them to my conclusions. I'm trying to say that this is what I'm thinking about. Perhaps you want to think about it or perhaps you don't, but there's a trust that I have that the work is sincere and that I'm doing something. I don't want to create a product. And I think a lot of what happens in the movie business is accepted: This is a product, and this will be marketed, and it will make people feel a certain way, and it'll leave the theater, and it'll go through a series of steps that are predetermined and formulaic. That precludes the possibility that you're going to create a work of art or a work that's expansive, and so I take that out of the equation, because I want something to be expansive, and because I feel people put crap into the world constantly in the media and in politics and in all sorts of public areas. And they lie. They constantly lie, and that creates a cynical, suspicious, alienated population of people, and I don't want to participate in it. I want to do something that, for whatever it's worth, maybe nothing, is at least what I think about things. And maybe that's helpful to somebody. AVC: It seems like a shock to the system if you're used to being fed product and you have to figure out a way to respond to a movie like Synecdoche, New York. CK: But that's a good thing. I remember when I was a little kid in school, you'd be given an open-ended assignment, and there was this panic, like "What do they want? I don't know what to do. What do they want me to do? I don't know what the assignment is." We have to get over that. I've always said, and I'll say it again, "There's no wrong way to look at this movie." I'm done with it. I have nothing more to do with it. It's yours as a viewer. Immerse yourself in it. This is what I have to offer at this point in my life, and as much as possible, I'm going to separate my ego from it. AVC: You don't seem like the sort of writer who has a set of note cards and knows what's going to happen in every scene, but your movies are very intricately constructed. How do you pull that off? CK: I take a very long time to write them. By doing that, I can allow myself to be expansive. As ideas come in, I can include them and then go back and figure out how to introduce them. So it's an ongoing process of back and forth and back and forth until I have a script. In this case, that took two years. So by the end, I'm pretty clear on it. I don't need cards to know where things are, and I start to understand relationships not only between people, but between parts of the movie, in new ways, and that's exciting for me. It keeps me excited about the process, and it allows for a certain amount of complexity in the construction. You know, it's weird: If you set up something early on as a structure or a goal, then that's what you write toward, and there's no opportunity to allow other stuff in. So you end up saying, "I can't do this, because this movie goes here." That doesn't interest me, and it doesn't feel exciting to work that way. So I don't. AVC: What was it like working on The Dana Carvey Show? CK: I don't know if it's because it's on the Internet now, but I'm getting asked a lot of questions about The Dana Carvey Show lately. It was a hard show to work on. It was almost impossible for me and a lot of the other writers to get anything on the show. Smigel had a small club of people who got stuff on the show, mostly Smigel and Louis C.K. and Dino [Stamatopoulos], who was their favorite writer of the staff writers. And sometimes the writer-performers who came from Second City like [Steve] Carell and [Stephen] Colbert had sketches that they had done at Second City that found their way onto the show. But having said that, I loved the people that worked on the show. I had a good time. I like all of them. I like Smigel, I like Louis, Dino is my friend, Robert Carlock who runs 30 Rock, Bob Odenkirk and David Cross for a while. It was a very good staff. Cool guys. But it was very short. We got cancelled very quickly. I don't remember how long we were on. It's cool, and a lot of people were in very different stages of their careers back then. Carell and Colbert weren't known. I wasn't known. Carlock wasn't known. But it would be cool to revisit it at a different time. If we could get stuff on the air now, what would it look like?